Joining the desert southwest with the intermountain west, Interstate 15 provides a major link between the interior of Canada, several transcontinental east-west corridors, Southern California, and Mexico. Travelers westbound on Interstates 40, 70 and 80 may easily transition to southbound I-15 to connect to Las Vegas, Los Angeles, San Diego and International Destinations in Mexico. Between these destinations, I-15 is an extremely busy highway, frequently backing up on holiday weekends in the Mojave Desert. Originating within Mission Valley in San Diego, Interstate 15 leads north through Murphy Canyon to Miramar Naval Air Station and Kearny Mesa as a busy commuter route to Poway, Rancho Bernardo and Escondido. This stretch includes HOT lanes (Interstate 15 Express Lanes) running between the north and southbound main lines. Continuing through the North County area of San Diego, I-15 reaches Riverside County and Temecula Valley. There the route splits with Interstate 215 (former I-15E) at Murrieta. I-215 ventures north through Menifee Valley to Perris and San Bernardino while I-15 stays west through Temecula Valley to Lake Elsinore, El Cerrito and Corona. Interstate 15 turns northeastward at Rancho Cucamonga to reconvene with I-215 at Cajon Canyon and Devore. The freeway meanders north through Cajon Canyon between the San Gabriel and San Bernardino Mountains. Historic U.S. 66 parallels this stretch, with portions still drivable to Cajon. A wide roadway split ensues north of Alray to Cajon Summit, with I-15 straightening out northeast to Apple Valley and Victorville. Long straight aways become the norm as Interstate 15 advances northeast to Barstow and across the Mojave Desert. 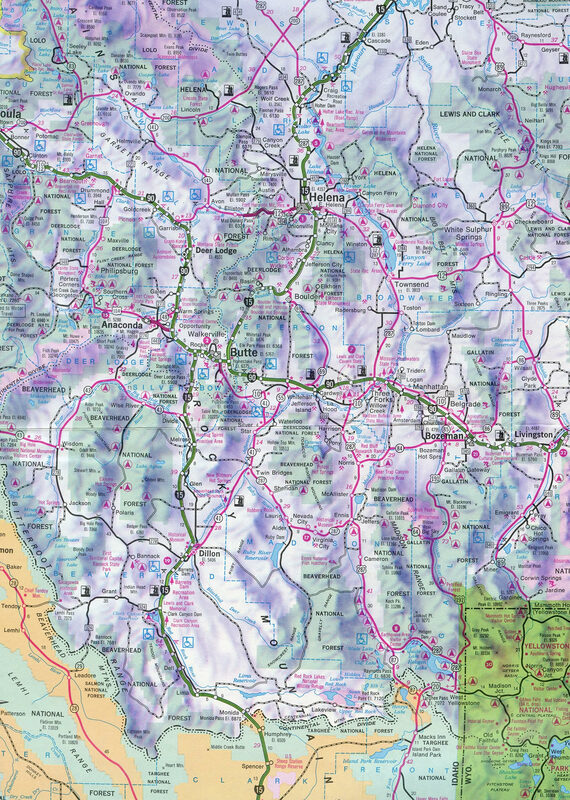 Some elevation changes remain along the route, such as where the freeway drops into Cronise Valley or passes between the Soda Mountains. Travelers traverse the dry bed of Ivanpah Lake before crossing the Clark County line into Nevada. Now heading more northerly, Interstate 15 progresses through Ivanpah Valley by the dry Roach Lake between Primm on the state line and Jean. Heavy traffic is common along this stretch during weekends with traffic heading between Los Angeles and Las Vegas. I-15 swings northward again into Paradise Valley and the south suburbs of Las Vegas. The freeway increases in both traffic and capacity, eventually reaching the Las Vegas Strip while en route to Downtown. Beyond North Las Vegas, I-15 turns more easterly again by Nellis Air Force Base and Las Vegas Motor Speedway to exit the Las Vegas metropolitan area for the trek to Dry Lake Valley, Mormon Mesa and Mesquite near the Arizona state line. A short but scenic stretch through Arizona ensues, with I-15 winding through Virgin River Gorge between the Beaver Dam and Virgin Mountains. Interstate 15 enters Utah at Big Valley and quickly approaches the growing city of St. George. St. George includes a Business Loop for I-15, which serves the city center to the north and west of the freeway. Northeast from there, I-15 parallels the Hurricane Cliffs to Cedar City and Parowan. The route leaves Parowan Valley to kink northward through Nevershine Hollow east of the South Hills. Smaller cities in Utah along I-15 include Beaver, Fillmore, Holden, Scipio and Nephi as the freeway varies in terrain through valley, canyon and hillsides. North of Juab Valley, Interstate 15 lowers into an agricultural area through a series of cities starting with Santaquin and culminating with Provo and Orem. The freeway stays in urban or suburban settings for the majority of the drive northward into Salt Lake City and Ogden. Overlaps along the route include ones with I-80 and I-84. Interstates 15 and 84 separate at Tremonton through Bear River Valley, with I-15 staying east of the West Hills through Malad Valley into Idaho. The freeway angles northeast across the Bannock Range into Marsh Valley ahead of Pocatello. Advancing from there, I-15 parallels the Snake River through mostly agricultural areas to Idaho Falls. 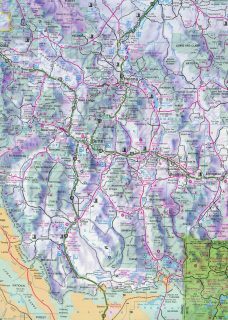 Sparsely populated lands lie north from there as the freeway extends to Targhee National Forest and the ascent to the Continental Divide and Montana. The bulk of the route through Montana directly overlaid U.S. 91. Interstate 15 varies between mountainous terrain and plateaus with farmland to Silver Bow. An eight-mile overlap takes I-15 along side Interstate 90 east to Butte. The freeway resumes a northern heading on the east side of the city through Deerlodge National Forest. A winding stretch takes I-15 east to Boulder and Boulder Valley, where the route straightens out and again turns north to the capital city of Helena. Interstate 15 follows the course of the Missouri River from east of Wolf Creek to Chestnut Valley and Great Falls. There hidden I-315 spurs into the city. A northwestern turn then takes I-15 from Great Falls to Vaughn. The remainder of the route is rural, as the freeway traverses Teton Ridge en route to Shelby, Sweetgrass and the Canadian Border. Interstate 15 from San Diego to Mesquite, Nevada via the Inland Empire and Las Vegas is part of High Priority Corridor 16 and 70: Economic Lifeline Corridor. The section of Interstate 15 from Las Vegas to Sweetgrass, Montana, is part of High Priority Corridor 26: CANAMEX Corridor. Between Great Falls and Sweetgrass, the freeway is also part of High Priority Corridor 27: Camino Real. Between San Diego and Temecula, Interstate 15 replaced U.S. 395. U.S. 395 largely still exists today as a busy expressway route from Hesperia north to Mammoth Lakes, Reno and Spokane, Washington. Remnant original sections of U.S. 395 in San Diego County are readily apparent along the Cabrillo Freeway (now California 163), Kearny Villa Road, Pomerado Road, Old Highway 395 and Rainbow-Temecula Road. At Temecula, Interstate 15 follows old California 71 to Corona and California 31 northward to Devore (Interstate 215). For much of its journey, Interstate 15 replaced U.S. 91 (and U.S. 466), which used to provide the most direct route from Los Angeles to Las Vegas. Interstate 15 meets old U.S. 91 (and U.S. 66-395) at Devore; the three routes were replaced by Interstate 15 over Cajon Pass. While U.S. 395 splits off at Hesperia and old U.S. 66 splits east at Barstow, Interstate 15 parallels U.S. 91 for the remainder of its journey northward. With the completion of the freeway through California, Nevada, Arizona, and Utah, U.S. 91 was relegated to frontage road status. Since western states generally do not maintain frontage or parallel service roads as state highways, U.S. 91 was decommissioned. Sections of old U.S. 91 are appear periodically along Interstate 15, both along the business loops through small and mid-sized cities and as frontage roads. One large extant segment of Old U.S. 91 bypasses Virgin River Gorge to the west in the vicinity of Arizona and Utah. For the brief portion of U.S. 91 between Ogden and Twin Falls, Interstate 15 actually replaced an earlier version of U.S. 191. As a result, this tiny section is all that remains of U.S. 91; U.S. 91 has also been completely decommissioned in Montana. Prior to 1969, Interstate 15 ended at Interstate 10 in San Bernardino, following what is now the northern extent of I-215. Photo scanned from the California Department of Public Works Biennial Report by Joel Windmiller. Through Southern California, Interstate 15 was originally proposed southward only to Interstate 10 in the San Bernardino vicinity. Extension of the route south to San Diego was included in the 1,500 mile Interstate system expansion legislation of 1968. This was confirmed by AASHO on June 24, 1969. The extension superseded the southernmost extent of U.S. 395. The bulk of Interstate 15 through California was constructed in the 1970s, with exceptions being across the Mojave Desert, where the freeway was constructed as early as 1961 from East Baker (Exit 248) to Cima Road (Exit 272). Through San Bernardino and Rancho Cucamonga, the route of I-215 defaulted as the mainline of I-15 until the section from California 91 to California 60 opened to traffic on February 28, 1989. A surface route, California 31, was labeled as TEMP I-15 until that time. 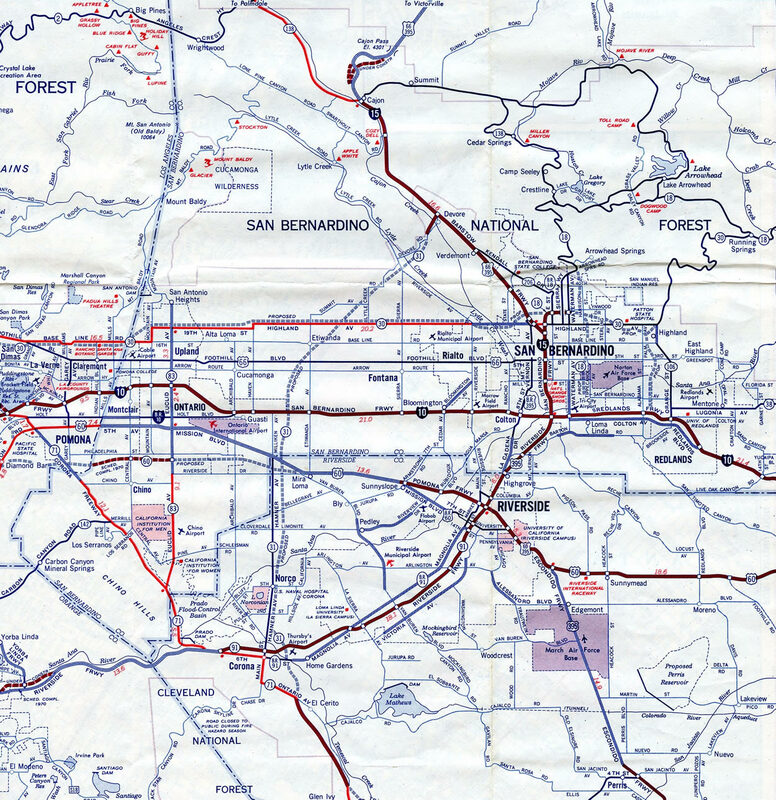 1969 map showing Interstate 15 ending at Interstate 10 in San Bernardino. Intestate 15 was temporarily routed through San Bernardino as TEMP I-15 along side completed portions of Interstate 15E freeway and the U.S. 395 expressway. 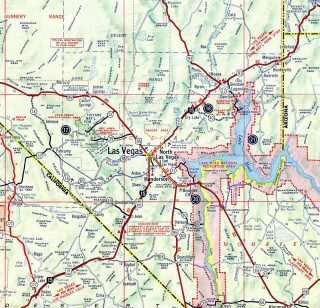 Interstate 15 was completed from the California state line to Sloan (Exit 25) and between Lake Valley and Crystal (Exit 75) by 1962 in southern Nevada. U.S. 466 was decommissioned through both California and Nevada in 1972. U.S. 91 followed suit and was truncated south of Brigham City, Utah in 1974. The final stretch of Interstate 15 completed in Nevada ran north from Charleston Boulevard (Exit 41) and Downtown Las Vegas to Lamb Boulevard (Exit 50). 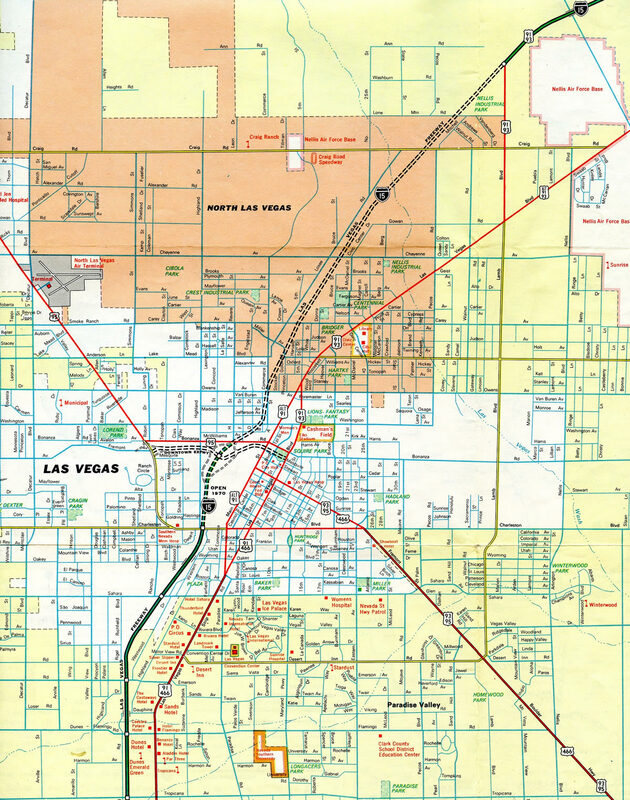 Las Vegas Boulevard is the former alignment of U.S. 91 & 466. 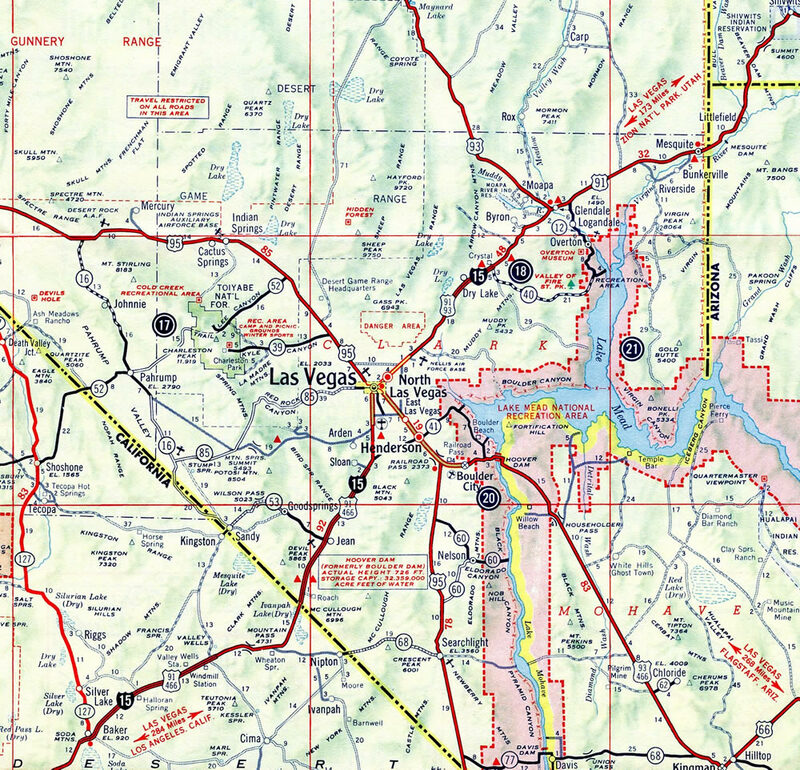 It was also incorporated as a Business Loop for I-15 and later as the route of Nevada 604. 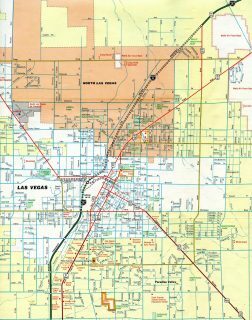 The famous roadway is now locally maintained and unnumbered south of Owens Avenue and the North Las Vegas city line. Interstates 15 south & 80 east overlap between South Salt Lake and Downtown Salt Lake City. The cosigned freeway includes c/d roadways separating local traffic movements from the mainline in both directions. Photo taken 08/05/13. Interstate 15 was built directly over old U.S. 91 through much of Montana. Super-two sections of freeway were used to the 1980s on some portions. This was a common occurrence throughout the Rocky Mountain states along Interstates 70 and 90. For more details and a time line of the Interstate 15 history in the Golden State, see the California Guide on AARoads. Wabash Boulevard was the predecessor to California 15 near the Barrio Logan community in San Diego. The boulevard was constructed to older freeway standards by the City of San Diego as a route between the Naval Center at 32nd Street and Mid-City. The freeway was initially not a part of the state highway system. Following the extension of Interstate 15 south into San Diego County, Wabash Boulevard was considered as the southernmost segment of the route. Known by most locals as “the 15”, Wabash Boulevard was eventually upgraded to Interstate standards between Interstate 5 and California 94 through the removal of some on-ramps and addition of longer acceleration ramps. For more on the Interstate 15 background in the Silver State, see the AARoads Guide for Interstate 15 Nevada. See the AARoads Guide for Interstate 15 Utah for historical dates on the original freeway construction in the Beehive State. The second suffixed route for Interstate 15 linked Pocatello with American Falls and I-80N near Rupert to the west. Signed as Interstate 15W, this was renumbered as the Western Interstate 86 as approved by AASHTO on July 6, 1977. Currently, the official southern terminus of Interstate 15 is at its junction with Interstate 8 in San Diego (Mission Valley) near Qualcomm Stadium. For many years, the freeway south of Interstate 8 was incomplete, with California 15 following 40th Street, a city street, through the Mid-City of San Diego. With the completion of the California 15 Freeway in January 2001, Interstate 15 is planned for extension to meet Interstate 5 in Barrio Logan. However, this redesignation has not occurred due to the substandard nature of the California 15 / 94 interchange. This interchange may be reconstructed as part of a project to add Express Lanes along California 94. Alternative 1 of the Express Lanes project includes the replacement of left-hand freeway-to-freeway connectors at the SR 94/SR 15 interchange with standard right-hand connectors. If approved, the project completion date is slated for 2025. This was revised from 2020 on the February 2015 Project Fact Sheet. Plans previously called for upgrading this interchange, along with the removal of left exits and blind merges, by 2008 and later beyond 2010. The final exit of Interstate 15 north joins the freeway end with 3rd Avenue in Sweetgrass. Photo taken 07/06/16. One half mile ahead of the Canadian port of entry along Interstate 15 north. Speed limits reduce from 80 to 55 than 45 miles per hour as the freeway enters Sweetgrass. Photo taken 07/06/16. The folded diamond interchange (Exit 397) with 3rd Avenue lies opposite the customs station in Sweetgrass. 3rd Avenue connects I-15 with a U.S.D.A. Animal Inspection Station and an agricultural business to the east and the Sweet Grass street grid to the west. Photo taken 07/06/16. Exit 397 provides the final departure point, or turn back, for I-15 north in the United States. Photo taken 07/06/16. Motorists continuing beyond the Exit 397 gore point immediately enter the Coutts, Alberta customs station. A pair of freeway ends and leaving Montana signs appear at the 3rd Avenue overpass. Photo taken 07/06/16. Looking at the customs station for Interstate 15 north from 3rd Avenue in Sweetgrass. Alberta 4 begins ahead and travels 64 miles northwest as an at-grade expressway to Alberta 3 in Lethbridge. Photo taken 07/06/16. 3rd Avenue connects Loop Road (Montana Secondary 214) with 2nd Avenue and the first southbound on-ramp for Interstate 15. Photo taken 07/06/16. 3rd Avenue dog legs east at 2nd Street to cross over Interstate 15 ahead of the loop ramp for Alberta 4 north to Lethbridge. Photo taken 07/06/16. The on-ramp from 3rd Avenue west to the port of entry is signed as Interstate 15, despite the freeway ending below the overpass. Photo taken 07/06/16. 3rd Avenue turns south at 2nd Street briefly to both the Interstate 15 rest area and southbound on-ramp to Great Falls. The freeway rest area resides within the loop ramp connecting Alberta with Sweet Grass. Photo taken 07/06/16. Montana Secondary 214 follows 3rd Avenue west to Loop Road from Sweetgrass to Sunburst as Interstate 15 south commences a 116 mile drive to Great Falls. Photo taken 07/06/16. Shields for Interstate 15 south and north direct motorists departing from the Sweetgrass rest area onto the adjacent on-ramp for Shelby and to 3rd Avenue east for Lethbridge, Alberta. Photo taken 07/06/16. Alberta 4 enters the United States port of entry beyond the turn off for 2nd Avenue North in Coutts. Photo taken by Rich Piehl (07/16/02). Proceeding south from the customs station and international border toward the freeway beginning of Interstate 15. This border crossing is significantly less crowded than the San Ysidro border crossing into Mexico, which is located only 12 miles beyond the southern terminus of California 15. Photo taken by Rich Piehl (07/16/02). Motorists depart from the last of the port of entry facilities and border crossing checkpoint and approach the 3rd Avenue overpass in Sweet Grass. Photo taken by Rich Piehl (07/16/02). Interstate 15 begins at the 3rd Avenue off-ramp (Exit 397) to Sweet Grass, a small border community along the 49th parallel. Montana Secondary 214 begins in Sweetgrass and leads west as an unpaved route to Montana Secondary 213 and Cut Bank. Photo taken by Rich Piehl (07/16/02). A view of the Exit 397 gore point sign from the adjacent rest area. The rest area doubles as a defacto welcome center for Montana with tourist information and maps. Photo taken 07/06/16. The first southbound ramp to Interstate 15 within the United States stems south from the intersection of 2nd Street, 3rd Avenue and the Sweetgrass rest area. Posted at the ramp beginning is this sign designating I-15 the Veterans Memorial Highway. Photo taken 07/06/16. Climbing onto a hill south from Sweetgrass, travelers pass by the first confirming marker for Interstate 15. Beyond the next exit of Sunburst, the freeway is devoid of traveler services to Shelby, 34 miles to the south. Photo taken 07/06/16. Interstate 15 south lowers from Murphy Canyon to enter Mission Valley ahead of Interstate 8 (Exit 6B). A six-ramp parclo interchange (Exit 7) departs here for Friars Road and adjacent Qualcomm Stadium. Photo taken 05/24/13. San Diego Mission Road passes over Interstate 15 just prior to the Exit 6B separation for Interstate 8 and Camino del Rio South. Photo taken 05/24/13. Spanning the San Diego River, Interstate 15 south ends and California 15 begins as Exit 6B departs for I-8. Interstate 8 travels west from Mission Valley to end at Mission Valley Park near Ocean Beach and east to La Mesa, El Cajon and Alpine. Photo taken 05/24/13. Exit 6B separates into a two-lane flyover for I-8 east and a single lane ramp for I-8 east. Interstate 8 takes drivers east toward San Diego University and Grossmont before leaving the urban areas via the Cuyamaca and Laguna Mountains of Cleveland National Forest. Photo taken 05/24/13. The exit for Interstate 8 west separates with a ramp for Exit 6B to Camino del Rio South, the south side frontage road for Interstate 8. Interstate 8 west connects I-15 with I-805, SR 163 and I-5 before terminating just northeast of Ocean Beach. Photo taken 05/24/13. 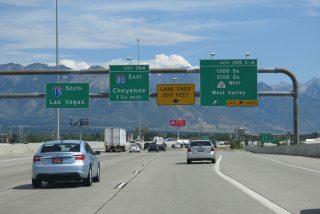 This set of button copy signs for Interstate 15 south at Interstate 8 was replaced by 2008 to show two lanes for I-8 east. Photo taken 08/08/04. The first sign for I-15 north and SR 15 south (Exit 7) appears below the high level bridge carrying Interstate 805 above Interstate 8 and Mission Valley. This segment of I-8 is routinely one of the most traveled sections of freeway in the city of San Diego. Photo taken 07/18/14. Back to back ramps (Exit 7) depart in one half mile for Interstate 15 north and California 15 south. I-15 begins its journey toward the Inland Empire, Mojave Desert, Utah, and Continental Divide in the shadows of adjacent Qualcomm Stadium (home of the San Diego Chargers). The freeway expands into a ten and twelve mile freeway with Express toll lanes through North County. Photo taken 07/18/14. Green overlays cover 40th Street for SR 15 south. SR 15 replaced 40th Street with the completion of the freeway section between Adams Avenue and I-805 in 1999. Photo taken 07/18/14. Eastbound Interstate 8 reaches Exit 7, California 15 south through Mid-City toward Barrio Logan, San Diego. The SR 15 freeway ends at 32nd Street, just north of Naval Base San Diego Station, adjacent to massive shipyards and the Coronado-San Diego Bay Bridge. Photo taken 07/18/14. The next exit along I-8 east is the two-pronged ramp for Interstate 15 north and three city streets. Fairmount Avenue, a major city street that leads south into the Mid-City community (including City Heights). Mission Gorge Road is a major southwest to northeast route that cuts a path roughly parallel to the San Diego River from the Mission Gorge neighborhood near I-8 all the way to SR 52 at Santee. Photo taken 07/18/14. Exit 7 departs and separates with two lanes for the adjacent interchange with Fairmount Avenue and Mission Gorge Road and a loop for Interstate 15 north. Riverside, the main control city of I-15 north, appears for the first time on I-8 east. Photo taken 07/18/14. An interchange sequence sign at the Waring Road overpass is the first appearance of Interstate 15 north along I-8 west. This sign was installed in 1998 following reconstruction of the SR 15 ramp to eliminate a blind merge. 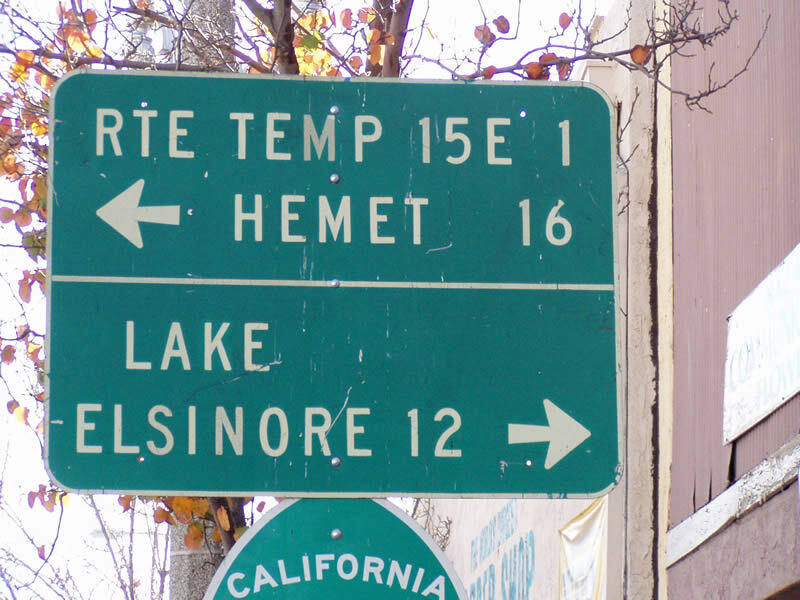 It was one of the last non-reflective, button-copy signs to be placed on a California freeway. Pictured here also is the Alvarado Canyon Road flyover leading west to Mission Gorge Road. This ramp was a mitigation measure built in 2001 as part of the trolley construction process. Photo taken 10/12/03. Interstate 8 travels with six overall lanes on the approach to Fairmount Avenue and Mission Gorge Road, two major arterials, and Interstate 15. I-8 through Mission Valley is among the busiest stretches of freeway in all of San Diego County. Photo taken 10/12/03. Westbound Interstate 8 reaches Exit 8, Mission Gorge Road northeast to Mission Trails Regional Park and Santee and Fairmount Avenue south to City Heights. Back to back ramps follow for I-15 north and California 15 south. Photo taken 10/12/03. Exit 7B quickly follows from I-8 west to Interstate 15 north for the northern reaches of San Diego, Escondido, Temecula, and Riverside / San Bernardino Counties. Photo taken 10/12/03. A loop ramp (Exit 7A) takes motorists south onto California 15 for Mid-City San Diego. SR 15 also provides a cutoff to I-805 south for National City and Chula Vista. Photo taken 10/12/03. Ramps from Fairmount Avenue north and Mission Gorge Road south come together and parallel the westbound mainline of I-8 and the elevated Green Line (light rail). Access is available from here to Interstate 8 west toward Ocean Beach and both SR 15 south to Mid-City and I-15 north to Mira Mesa. Photo taken 03/27/05. Two lanes depart from the Fairmount Avenue / Mission Gorge Road on-ramp for Interstate 15 north. As part of the construction of the California 15 freeway along 40th Street, a new ramp was added from westbound I-8 for southbound SR 15. Prior to the improvement, motorists had to cut across three lanes of traffic from the left to access the loop ramp to the right. A flyover ramp accommodates this movement now. Photo taken 03/27/05. Northbound California 15 at Adams Avenue (Exit 6A), one mile south of the transition to I-15 at Interstate 8. This is the end of the 2001 opened section of the SR 15 freeway. The route between here and Interstate 8 was improved in 2001, but it was a freeway prior to that. Photo taken 07/28/14. Interstate 8 leads toward the eastern end of the city of San Diego, as well as the suburbs of La Mesa and El Cajon. Heading west, I-8 enters Mission Valley, then follows the San Diego River until it terminates in Mission Bay Park at Sunset Cliffs and Nimitz Boulevards. Photo taken 07/28/14. All traffic to I-8 and Camino del Rio South departs in unison at the forthcoming cloverstack interchange (Exit 6B). Photo taken 04/09/06. The freeway descends from City Heights into the Mission Valley community, which follows the San Diego River on an east-west course through the center of San Diego. Exit 6B departs here for both Interstate 8 and Camino del Rio South. Photo taken 07/28/14. The first confirming signage for northbound Interstate 15 appears prior to the Friars Road (Exits 7A/B) parclo interchange for Qualcomm Stadium. Beyond here, I-15 heads north through Murphy Canyon before ascending to Mira Mesa, Scripps Ranch, and Rancho Bernardo. Photo taken 04/09/06. A left-hand ramp (Exit 1C) departs from the California 15 southbound mainline for I-5 south to National City, Chula Vista and Tijuana, Mexico. The remainder of the SR 15 freeway continues to I-5 north (Exit 1B) and Wabash Boulevard (Exit 1A). Photo taken 08/08/04. Wabash Boulevard, a city of San Diego maintained freeway, extends south from the end of California 15 to 32nd Street. 32nd Street connects the boulevard with Harbor Drive and the gate to Naval Base San Diego nearby. Photo taken 08/08/04. As Interstate 5 leaves Downtown San Diego, it parallels San Diego Bay and makes several turns toward the southeast ahead of National City. Traffic joins the freeway southbound from the Coronado Bridge on the one mile approach to California 15. Photo taken 05/22/04. One half mile ahead of Exit 13A for SR 15 north. Named the Escondido Freeway, California 15 heads north from along the old Wabash Boulevard Expressway and 40th Street Corridor to become Interstate 15 at its interchange with I-8. Photo taken 05/22/04. Ice plant, commonly used on San Diego’s freeways as a landscaping feature to keep rights of way looking green, appears on both sides of Interstate 5 as it approaches Exit 13A for California 15 north. Photo taken 05/22/04. An exit number sign was posted for Interstate 15 in place of California 15 during summer 2006 It stands adjacent to the 28th Street overpass at the Barrio Logan community. Photo taken 12/03/06. A loop ramp (Exit 13A) departs I-5 south for California 15 north to Mid-City. There is no access in this direction to Wabash Boulevard south to Harbor Drive. Photo taken 05/22/04. Interstate 5 follows the historic alignment of U.S. 101 (Montgomery Freeway) north through National City to meet California 15 in one mile. Photo taken 07/19/14. Exit 12 parts ways with Interstate 5 north for Main Street and Division Streets. The parclo interchange marks the city boundary between San Diego to the north and National City to the south. California 15 begins at the ensuing exit within the San Diego community of Barrio Logan. Photo taken 07/19/14. The control city for California 15 and Interstate 15 north in San Diego County is Riverside. 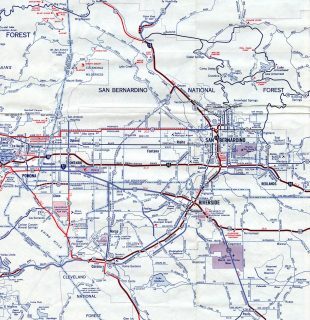 The original proposed alignment for I-15 north of Temecula took the route through both Riverside and San Bernardino. That changed by 1970 to Corona and Ontario, with Riverside served by I-15E and later Interstate 215. Photo taken 07/19/14. High speed ramps connect I-5 north with SR 15 north and SR 15 south with I-5 south. This is an otherwise incomplete interchange, as California 252 was originally planned to begin here. Known as the Southcrest Freeway and killed by local opposition in 1980, the unconstructed SR 252 was projected east to the high speed ramps at the I-805 and 43rd Street interchange. Photo taken 07/19/14. 32nd Street leads north from Harbor Boulevard (former U.S. 101) and quickly splits with the freeway beginning of California 15. The signalized split is preceded by an erroneous Interstate 15 overhead. Photo taken 12/03/06. A second Interstate 15 shield appears as Wabash Boulevard branches northeast from 32nd Street and Norman Scott Road. Photo taken 12/03/06. The city of San Diego placed an Interstate shield along Wabash Boulevard north, just after the traffic signal with 32nd Street. It was removed by 2003, and replaced later for a brief time with another I-15 marker. Photo taken 03/98. Maintained by the city of San Diego, Wabash Boulevard is a limited access roadway that leads directly onto California 15 north prior to the I-5 over crossing. Photo taken 12/03/06. A begin freeway sign appears at the Main Street underpass as Wabash Boulevard transitions directly onto California 15 north. Photo taken 12/03/06. There is no access from California 15 north to either direction of Interstate 5. The Montgomery Freeway passes over SR 15 between National City and Downtown, San Diego. Photo taken 12/03/06. This first California 15 north shield assembly precedes the flyovers to and from Interstate 5. Subsequent exits connect with Logan Heights, Mt. Hope and California 94 (Dr. Martin Luther King, Jr. Freeway). Photo taken 12/03/06. “Re: Interstate 15E signage in San Bernardino and Riverside Counties?” online posting by sparker, AARoads Forum, July 13, 2016. “Let the Construction Begin; I-15: UDOT Selects Low Bidder; I-15: UDOT Picks Low Bidder for $1.6 Billion Rebuild.” Salt Lake Tribune, The (UT), March 27, 1997. “Timeline outlines Montana Department of Transportation history.” Montana Standard, June 16, 2013. Page updated July 16, 2016.